Southern senior Logan Drummer (11) breaks away from the pack, during a first half run in the Tornadoes’ victory on Friday in Racine, Ohio. SHS corner back Chase Bailey (3) intercepts a Miller pass, during the first half of the Tornadoes’ victory on Friday in Racine, Ohio. RACINE, Ohio — Score early, score often. 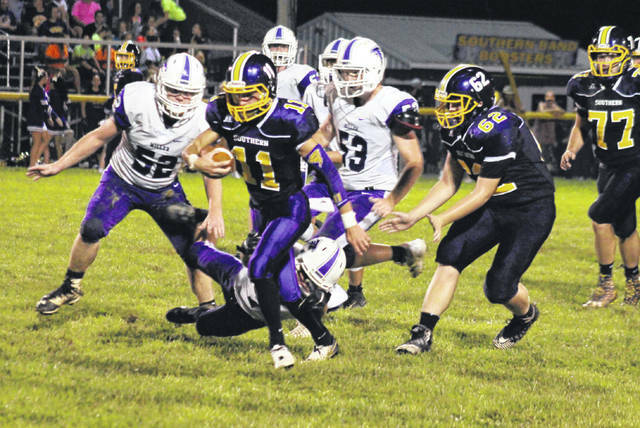 The Southern football team found the end zone seven times in the first half of Friday’s Tri-Valley Conference Hocking Division matchup at Roger Lee Adams Memorial Field in Meigs County, and the Tornadoes cruised to a 58-13 victory over visiting Miller. 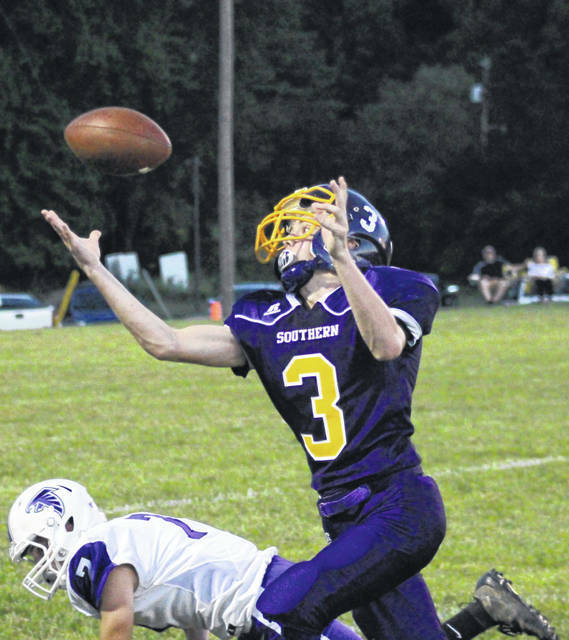 After a 62-yard Brody Dutton kickoff return to open the game, Southern (4-0, 1-0 TVC Hocking) needed just two plays to break the scoreless tie, with Logan Drummer tossing an 18-yard touchdown pass to Trey McNickle. Drummer made the point-after kick, giving the host a 7-0 lead just 34 seconds into the game. The Falcons (1-3, 1-2) earned a first down via a fake punt on their first drive of the game, but three plays later, Miller was forced to punt for real. The Tornadoes went three-and-out on their next possession, but Chase Bailey intercepted a Miller pass on the third play of the ensuing Falcon drive. On the third play of Southern’s third drive, McNickle broke a 30-yard run for a touchdown, giving the Tornadoes a 13-0 lead with 5:10 left in the first quarter. Miller fumbled the ball back to the hosts on their first play from scrimmage, and Southern took advantage two plays later, as Drummer connected with McNickle for a 42-yard scoring pass. McNickle ran in the two-point conversion, making Southern’s lead 21-0 with 4:41 left in the first. MHS senior Rusty Greenich returned the ensuing kickoff 85 yards for a touchdown, and Lucas Dishon made the point-after kick, cutting Southern’s lead to 21-7. The Falcon defense forced a three-and-out and Miller’s offense took over at its own 32 with 3:35 left in the first quarter. The guests covered 68 yards in nine plays, with Colby Bartley finding Blayton Cox for an 18-yard scoring pass, trimming the Tornado lead to 21-13 with 11:14 left in the first half. On the third play of Southern’s next drive, Drummer found Dutton down the right sideline for a 74-yard scoring pass. Drummer’s extra-point kick was successful, giving the Tornadoes a 28-13 advantage with 10:01 left in the half. Dutton intercepted an MHS pass on the fourth play of the ensuing Falcon drive, giving the Tornadoes the ball at their own 41. Sandwiched around a short run, Southern had a pair of passes go for over 20 yards, and then Drummer found McNickle for a 14-yard touchdown pass to give SHS a 34-13 lead with 7:24 remaining in the half. Miller went three-and-out on the its next possession, and after a 30-yard punt return, the Tornadoes needed four plays to get to the end zone. Drummer found Gage Shuler from 10 yards out for the scoring pass that, with McNickle’s two-point conversion run, gave the Purple and Gold a 42-13 lead at the 3:59 mark of the second quarter. Southern’s defense came up with a second straight three-and-out, but this time the punt went out of bounds, pinning the Tornadoes back to their own 26 with just under three minutes left in the half. The SHS offense quickly covered the 74 yards in seven plays, with Drummer tossing a four-yard touchdown to Weston Thorla at the 1:27 mark of the quarter. Miller gained a first down before heading into halftime behind 48-13. Both offense went three-and-out to start the second half, and the Falcons came up empty on a fourth down try on their second drive. On the third play of Southern’s second drive of the second half, Drummer busted through the Falcon defense for a 43-yard touchdown run. Drummer’s extra-point kick gave Southern 55-13 lead with 27 seconds left in the third quarter. Gage Shuler intercepted a Falcons pass on the first play of the fourth quarter, but Southern fumbled the ball back to the guests after two plays. Southern stopped Miller on fourth down and, after gaining 39 yards in eight plays, Drummer split the uprights on a 42-yard field goal. Following the 58-13 victory, first-year Tornadoes head coach Cassady Willford was pleased with his team on both sides of the ball. “Our defense is playing lights out and our offense is playing strong,” Willford said. “On defense, I give all the praise to Coach Olexa, Coach Dailey, Coach Circle, Coach Stevens, all of our assistant coaches, everything they do for us defensively is great. When your’re getting the ball back after three-and-out, three-and-out, three-and-out, it’s awesome. On special teams, give it up to Logan Drummer for that 42-yard field goal, we’ll have to check the record books. Southern picked up a 17-to-10 edge in first downs, and a 439-to-203 advantage in total offense, including 177-to-92 on the ground. The Tornadoes won the turnover battle by a 5-1 tally. Both teams committed a pair of penalties, SHS for 20 yards and MHS for 19. Drummer was 13-of-20 passing for 252 yards and six touchdown, while leading the team in rushing with 82 yards and a touchdown on nine carries. Trey McNickle combined three receptions and four carries to total 133 yards and four touchdowns. 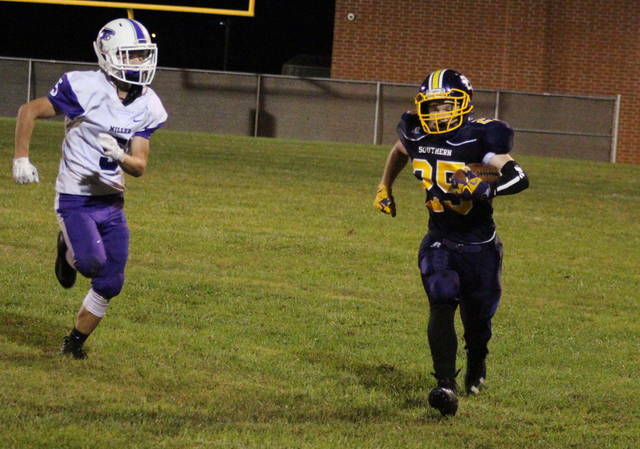 Reece Reuter had 50 total yards on three carries and a reception, Thorla picked up 33 yards and a touchdown on three receptions and one carry, while Shuler had 30 yards and a touchdown on three carries and three receptions. Austin Baker caught three passes for 32 yards, Dutton had two grabs for 80 yards and a touchdown, while Jonah Diddle carried the ball twice for a total of three yards. Thorla and Diddle each recovered a fumble on defense. For Miller, Bartley was 10-of-21 passing for 111 yards and a touchdown, while rushing five times for six yards. Cox had 90 yards and a touchdown, combining six receptions and eight carries, while Devon Crabtree had 75 total yards on 15 carries and three catches. The Tornadoes head to Washington County next, as they visit Belpre. 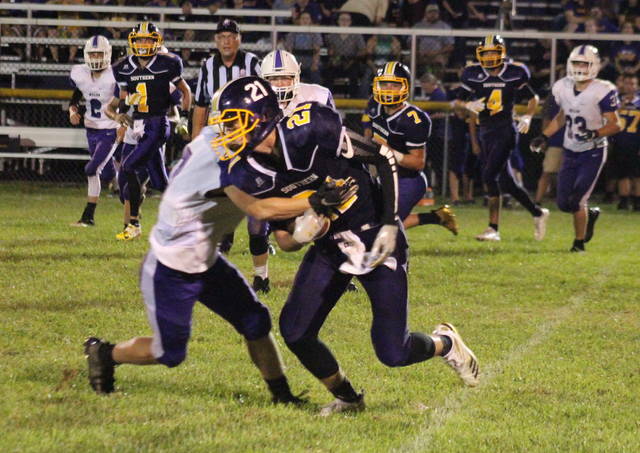 The Golden Eagles are coming off back-to-back wins, including a 41-22 win at Wahama on Friday.